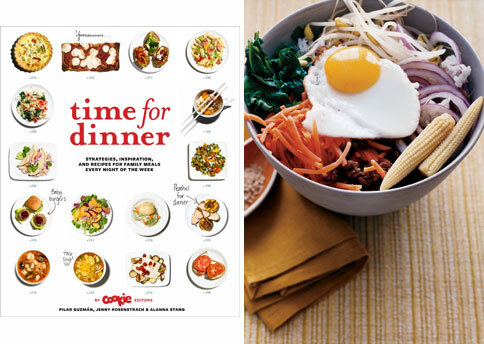 Time for Dinner cracks Bon Appetit’s Favorite Cookbooks of 2010 list! And as if that’s not already exciting enough, they put us right next to Paul Greenberg and a few doors down from Allegra Goodman. That is fantastic news!! I am genuinely so, so happy for you! I’ve checked it out from the library & it’s going on my xmas list – definitely a keeper! I got this book and it is amazing- very helpful when trying to get meals on the table! Thank you! Congratulations! I’m giving it as my gift to friends this year, I can’t wait to show them all the awesome recipes that are in there. We have made SO many its hard to count them all. Congrats! It really is a great book and has revitalized my table. Thank you for the yummy goodness and the great looking book. It is a fun read. Well deserved!!!! Congratulations!! It is a huge hit at our house! wow – that is amazing! congratulations. I just tried the bi bim bap recipe last week and LOVED it!! Congratulations. Well deserved. I love this book. The pictures and recipes inspire me to actually cook and not run out to Subway. Congratulations, you’re living the dream! I could not possibly love this book anymore than I do. I have made so many of the receipes and had the greatest success!!!! I just made the crepes last night and we had the most wonderful dinner! I love all of the “buffet” meals, the chinese noodles are a huge hit!! I can’t thank you enough. I recommend your book to everyone I know. Keep up the great work! Holy Crap! Two away from Noma too…I am thrilled for you, quite an accomplishment. I think you offically have rock star status in the food wordl. Seems very fitting….I love it too! You deserve it! I picked the book up from the library last week and plowed right through it. Not only is it full of healthy, practical recipes, but the section “I want to use what I already have” really inspired me to try cooking a little more without recipes. Thank you for creating a wonderful resource with some inspiration to boot! CONGRATS! Can’t wait for Xmas – it is on everyone’s list!